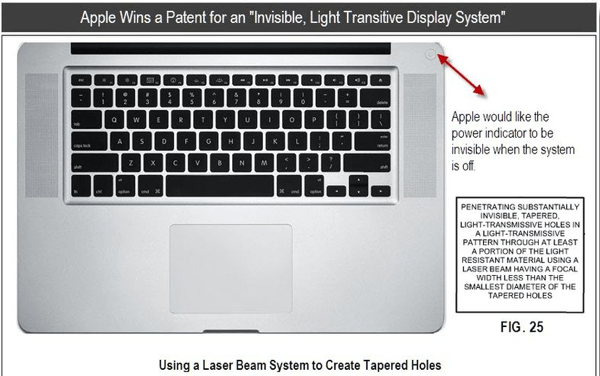 Hidden inside a sheathe of patents awarded to Apple today is a particularly interesting one that suggests that your future Mac just might be a slab of aluminum that glows. If you look at the back of your MacBook, it’s pretty easy to piece together Apple’s current process in making the Apple logo glow. They carve a cut-out of the Apple logo in the MacBook lid, close it up with a sheet of opaque white plastic and when your display is on, the light leaking out causes the logo to emit light. What Apple wants to do is make the logos and LED displays of future Macs glow without carving a hole in the aluminum. They basically want light-emitting logos and indicators to be invisible unless they are emitting light. How do they intend to make an unhewn chunk of aluminum glow? The new process describes a way to thin out aluminum in spots so that it’s wafer thin, at which point Apple will drill thousands of microscopic holes in specific designs in order to create the illuminated shape. This tech could cover everything from the ubiquitous glowing Apple logo to your MacBook’s power button indicator or MagSafe connector. Revolutionary? Not at all, but it’s exactly the sort of refinement Apple loves: a small tweak that makes the entire product feel less like a box full of circuits than a slab of magic.